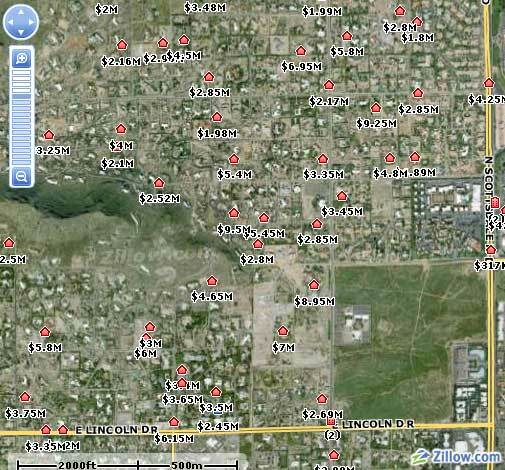 Don't buy property in Paradise Valley (a suburb of Phoenix, near Scottsdale) if you actually expect the property to be fully your own. Even the smallest revisions of your home can require multiple appearances in front of the town council. By some odd statistical anomaly, property owners with friends in the city government seem to get these changes approved more readily than those without such influence. Anyway, things just get worse if you own a lot of land in PV. homes on about 105 acres northwest of Scottsdale Road and Lincoln Drive. This really isn't very high density, but this can be a very flaky town. One thing you have to realize is that I can't remember the last new home I saw go up in PV that was less than 5000 sq ft and 10,000+ sq ft is not at all unusual. This may be one of the few cases where a town is trying to keep out the Ritz Carlton because its customers will bring down the neighborhood, lol, but that is exactly what is at work here, in part. Now I know you think I am exaggerating when I say the locals are worried about a Ritz-Carlton bringing down the neighborhood by attracting the unwashed, but here is the Zillow sales page for the area -- the vacant lot in the lower right is the property in question. This piece of land has been empty and zoned for a resort for years. I know it was zoned for a resort long before this sale because I was stuck in traffic court all day and had nothing to stare at but the town zoning map (don't ever speed when crossing PV). The buyers purchased this land several years ago (I think from the Wrigley family) after ensuring the zoning was solid. If the town's residents wanted something else on the lot, they should have bought it themselves. But it is ever so much cheaper to instead use your political influence to tell other people what they can and can't do with their property. Another thought: It is nearly an article of faith among libertarians that devolving government to the smallest possible unit enhances freedom. Well, here is an example where it does not. Not state or even city would pass a ballot resolution to change the zoning on one small piece of land. But it is entirely possible this could pass in a town of just a few thousand people. Is that Mummy mountain in the photo? Is this across from where Judson School use to be? Mocking Bird Lane? Really enjoy your blog I try to check it daily. What's new about the rich and powerful saying "I got mine. You ain't getting yours?" "It is nearly an article of faith among libertarians that devolving government to the smallest possible unit enhances freedom." I'm no libertarian, but when it comes to obtrusive government zoing laws, I'm in your court. I once lived in a small town that in the 1960s had decided to make it against the law for people to live in apartments above stores. This (along with the opening of a shopping mall) effectively led to the death of the downtown area, and it took 20 years for the city fathers to realize what a ridiculous law this was. In the 1990s, the law was finally revoked and people were allowed to move back downtown. This didn't immediately rejuvenate things, but it was a step in the right direction. So if you build housing that's too dispersed, you're killing the environment and creating the dreaded sprawl. If you build too dense, on the other hand, you run into this. I guess they just don't want people to build, period. A counter to small-town oligarchy is constitutionally-limited government. Municipal power to zone is derived and delegated from the State (AZ). The failure is not entirely that of more-local government. Freedom was lost when the State created the power to zone. Now that the gatekeepers of Pleasant Valley are exercising (or abusing) the power to lock people out, citizens might realize they've been caged all along. It seems a lot like selective enforcement of traffic law. Maybe not a change via the ballot but I've seen on public access TV the Minneapolis zoning committee spend over 5 minutes discussing what sort of siding a house is going to have and what they thought it should have. A city of 380,000 and they have time for that? Allen, I call it the He-Man syndrome, after the cartoon show where the guy yells "I have the power!". What's the sense in running for an office if you can't make sombody do what you want? I'm no fan of the town of PV (fortunately I live in a country island, unfortunately it is surrounded by PV and it's traffic radars). But, if the property was zoned for resort, then the property owner has no legitimate expectation for it to be rezoned for relatively (for PV) high density housing. Zoning is a violation of rights when it changes ex-post-facto (which is why my 50 year old neighborhood will NEVER be annexed by PV). But once it is in place, it's just part of the environment for the owner of the property. So the owners should build a new resort there, which would really tick off the snooty PV owners. BTW, PV was the first town in the US to use photo-radar, and the residents of the town seem to love it. I think they want to keep the ordinary mortals from driving through their "special" town. The radar will not give you a ticket if you are under speed limit + 11mph. Since the speed limit is about 5mph too slow, that lets you drive a reasonable speed. However, beware the stop-light cameras. PV used to avoid constitutional challenges to its photo-radar system by simply dismissing the ticket of anyone who seriously challenged it. Thus the constitutional limit was of limited utility. Devolving government to the smallest feasible unit enables, but hardly guarantees, a locale with more liberty than one with a more distant government trying to apply the same rule to everyone regardless of location or desire. Basically if can manage to neuter the federal government and state governments, what we would likely end up with is a patchwork of goverments that range from fascist/socialist/corrupt to quasigovernments that rule/non-rule in an anarcho-capitalist spirit. Under such a system, it is buyer (of a home or other property) beware. Government is little more than legalized theft, so don't be shocked if that holds true in some local governments. It is in the DNA of the system. Government is a necessary evil for certain things - such as mutual protection against crime and foreign adversaries. That it engages in theft is a price we pay. Devolution does in deed enable more freedom in some areas. The federalist approach seemed at one time like a good mix. Maybe now we need one more layer, as the states have grown so big. PV sounds like a NIMBY town. Thats just for beginners. I live in Vineyard Haven on the Island of Martha's Vineyard. Here people have gone BANANAs (Build absolutely nothing anywhere near anything. In addition to town zoning laws that are very restrictive ( I could not put up a windmill tall enough to reach over the tree line due to zoning restrictions on my 3/4 acre property) we also have the Martha's Vineyard Commission as a regional governing authority. The commission is charged with reviewing developments of regional impact. The idea behind it was to preserve the character of Martha's Vineyard by preventing dense developments. There is some merit to the organization because of our limited fresh water resources that would be overburdened by dense development. That point aside the organization is a study in the abuse of local power. They consider any commercial building over 2000 sq feet a development of regional impact. Once they have authority over a project they retain perpetual rights to review any future changes to it. Now if only they were considering parts of the project such as water usage that does have a regional impact, but instead they seemed to be concerned with other "important" issues such as color or type of siding. They even went as far as deciding that a business owner could not build a gas station on his commercially zoned property because of the adverse regional effect it would have other the other island gas stations! Because of the obviously tenuous argument they back up their decision with a traffic study that showed surprisingly that there would be increased traffic in front of the gas station along an already busy road. I guess it would have been alright if the gas station had promised to fail and therefore not adversely affect the competition or local traffic. So for those of you wishing for an extra layer of government to curb local authority where the state doesn't want to step in beware of what you wish for. Every level of government besides the individual has a basic uncorrectable flaw. People get elected to government so that they can have the power to make things the way they want them and will impose whatever rules they feel they can justify to a sufficient number of voters to be applied to everybody. The problem lies is the fact that people who we need in government don't want the job. My only solution (hope) is that I can convince people that they should feel obligated to seek public office on any level. Unfortunately the last major public official to feel this obligation was George Washington.